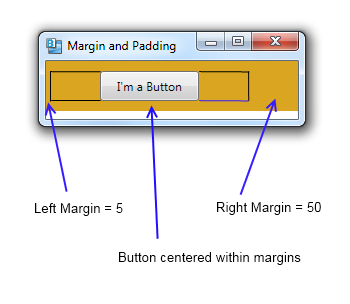 A control’s Margin property specifies the spacing between the edges of the control and its container. A control’s Padding property specifies the spacing between the edges of the control and its interior content. In the example below, we specify the Margin. Because the HorzontalAlignment is Stretch (the default), the left/right Padding values are ignored and the Button is stretched to reach the desired Margin values. If we now set HorizontalAlignment to Center, the control will size to fit its content. The Padding values will be honored exactly and the control will be centered horizontally within the available space after the specified left and right Margin values have been accounted for. This becomes more clear when we draw lines for the specified Margin values.